Jesus Christ Was “Father-Centered”—Are You? God He Is Risen! Now What? Many martyrs have given their lives for something they believe in. But one sacrifice surpasses them all—that of our Creator. What was it for? “Jesus died for your sins!” You’ve heard that statement before, but have you fully considered what really happened that day almost 2,000 years ago on a lonely hillside outside Jerusalem and what it means for you and me? Yes, sometimes we see someone die for a person or a cause he or she believes in. One heartrending example of this occurred June 20, 2009, as a 26-year-old Iranian woman named Neda was hit in the chest by a single bullet during a demonstration in the streets of Tehran. It was all caught on video and broadcast around the world. Within hours, millions witnessed her last moments of life. You could see the fear in her eyes; “What is happening to me?” they seemed to say. Within a few minutes she was dead in a pool of blood. While Neda did not go into the streets that day expecting to die, she was proclaimed a martyr for Iranian freedom. One of the most famous books in Christian literature is Foxe’s Book of Martyrs, written by John Foxe (or Fox) in the 16th century to record the history of Christian martyrs after the founding of the Church. He begins with the account in Acts 7 of Stephen, falsely accused of blasphemy. After delivering a powerful defense that condemned his accusers, Stephen suffered the horrible death of stoning, becoming the first martyr standing up for the name of Christ. Only one individual was perfect, sinless and completely innocent, and yet willingly gave His life for the greatest cause of all. Foxe then records the traditions that James, the son of Zebedee and disciple of Jesus Christ, was beheaded. Philip was beaten, thrown into prison and then crucified. James, the brother of Jesus, “at the age of ninety-four was beaten and stoned by the Jews; and finally had his brains dashed out with a fuller’s club.” Peter was crucified, and Paul was beheaded. As far as we know, John was the only one of the original 12 apostles who did not suffer a martyr’s death. Throughout history, we have seen those who have made noteworthy, even heroic, sacrifices in laying down their lives. But even the men and women who died for the name of Christ, though they were righteous, can’t be counted as the greatest sacrifice. That distinction was earned by Someone else. Only one individual was perfect, sinless and completely innocent, and yet willingly gave His life for the greatest cause of all—laying down His life as a sacrifice for all humanity that we might live! He was the Son of God, and He gave His life for the sins of the world (John 3:16). He did not die only for His friends. Paul emphasized in Romans 5:6 that “Christ died for the ungodly.” And again in Romans 6:10 we read, “For the death that He died, He died to sin once for all” (emphasis added). No one else could die for such a cause—to make forgiveness of sin, freedom from sin and reconciliation to God possible for all humanity. It was, and will always be, the greatest sacrifice ever made. Who was Jesus Christ? In his book More Than a Carpenter, Josh McDowell declares that once you examine the actual claims of Jesus and His eyewitness followers, we are left with only three options: Jesus was either a liar, a lunatic or our Lord. It’s important that we know. Many years after Jesus died and was resurrected, the apostle Paul warned about those already preaching “another Jesus” (2 Corinthians 11:4). This is exactly what we see today. The Jesus preached today isn’t the Jesus we read about in the Bible in virtually everything from His appearance to His doctrine! Today Jesus is commonly pictured as a weak, long-haired, effeminate-looking individual. Is this the real Jesus, the son of a carpenter who lived in first-century Judea? In recent years articles have shown what an average Jew of the first century would have looked like, and it’s nothing like the pictures and icons of Jesus seen in churches and cathedrals today. Based on biblical and historical records, these depictions are simply not accurate. What we do know from Scripture is that the Word, the One who was born of a virgin as Jesus Christ our Savior, was “God with us” (Matthew 1:23) and God “manifested in the flesh” (1 Timothy 3:16). And in John 1 we are told that “the Word was with God, and the Word was God,” and that “all things were made through Him” (verses 1 and 3). And yet He “made Himself of no reputation, taking the form of a bondservant, and coming in the likeness of men. And being found in appearance as a man, He humbled Himself and became obedient to the point of death, even the death of the cross” (Philippians 2:7-8). Through His selfless sacrifice, “we have been sanctified through the offering of the body of Jesus Christ once for all” (Hebrews 10:10). Consider the events surrounding His crucifixion. In the spring of A.D. 31, just around midnight, a few hours after the Passover observance, soldiers and religious officials arrested Jesus. They dragged Him first to Annas (John 18:13), the former high priest, then to Caiaphas (verse 24), the current high priest, and the Sanhedrin or council. The two high priests and the Sanhedrin condemned Him to death, but they needed the approval of the Roman authorities. So, Jesus was charged with blasphemy and taken to Pilate, the appointed Roman governor. Pilate sent Him to Herod, who questioned Him and then sent Him back to Pilate. Finally Pilate gave the approval, and Jesus was crucified at about 9 a.m. (Mark 15:25) on the morning of Passover day. This followed nine hours of interrogation, taunting and beating. About six hours later the Messiah and Son of God died on a hill called Golgotha (John 19:17) just outside the walls of Jerusalem. As God in the flesh, His sacrifice was the pivotal point and most important event in all human history. How could God die? This is a difficult concept for us to understand, but we believe what the Scriptures tell us—He died and His body was placed “in the heart of the earth,” the tomb, for three days and three nights (Matthew 12:40). Paul declares that we must partake of this service in a worthy manner because doing otherwise makes us “guilty of the body and blood of the Lord” (1 Corinthians 11:27). None of us is “worthy” of the sacrifice of Christ—Paul is simply explaining that we should partake of the Passover properly, having taken the time to seriously reflect on what it means for us. The Passover service also includes the foot-washing ceremony described in John 13, which pictures our willingness to serve one another as Christ served us. “In the same manner He also took the cup after supper, saying, ‘This cup is the new covenant in My blood. This do, as often as you drink it, in remembrance of Me.’ For as often as you eat this bread and drink this cup, you proclaim the Lord’s death till He comes” (1 Corinthians 11:23-26). Through this simple, but deeply meaningful, commemoration, faithful Christians proclaim the death of Jesus Christ. But what about His resurrection? Certainly we should acknowledge the importance of the resurrection, but the biblical command is to annually observe the Passover and proclaim Jesus’ death. One must ask why, when the majority of the Christian world is busy observing Easter, do people pay so little heed to the fact that not only is Easter not found in Scripture, but its observances are based on pagan practices (see our article “Origin of Easter”)? Not only do rabbits and eggs have nothing to do with worshipping Christ, they denigrate the real meaning of His death and resurrection! On the other hand, when baptized members of the Church of God gather each year for the Passover, the atmosphere for the service is subdued. It isn’t that we are without joy and thanksgiving for what Christ did, but we are there to reflect on a death—the death of our Savior, Jesus Christ, whose sacrifice makes it possible for each one of us to be reconciled to God. Our sins, which separate us from God, are removed by this act of love. There is so much more to the sacrifice of Jesus Christ. Everything changed on that spring day. In the years following Jesus’ crucifixion and resurrection, His disciples turned the world upside down with their message (Acts 17:6), and many of them died for it. Their conviction and courage can be traced back to the time when the Father raised Jesus from the dead, confirming His acceptance of Christ’s sacrifice (Acts 2:23-24) on a hillside outside Jerusalem. 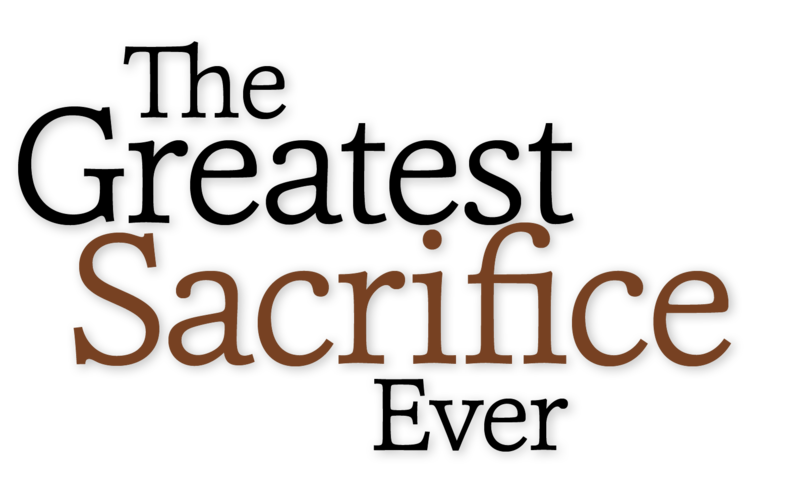 What does that sacrifice mean to you? If you have repented and been baptized (Acts 2:38; 20:21), how prepared are you for this year’s Passover? No one is worthy, but each of us must take the time to reflect on what Christ did for all of us. Make sure you do just that and then participate in the Passover, proclaiming the death of our Savior, the greatest sacrifice ever made.